They are now in my garden taking out my ash trees - emerald ash borers. Emerald ash borers Agrilus planipennis Fairmaire are an exotic beetle from Asia that was discovered in North America near Detroit, Michigan in the summer of 2002. The adults look like grasshoppers from the Emerald City in Oz, iridescent green with large black eyes. The adult beetles nibble on ash foliage, causing little damage. The larvae, however, is another story. The immature emerald ash borers feed on the inner bark of ash trees, disrupting the tree's ability to transport water and nutrients, eventually killing the tree. No one knows for sure but the emerald ash borers probably arrived in the United States on solid wood packing material transported from Asia. It’s suspected they spread by hitchhiking on firewood transported among homes and recreation areas in at least 34 states. I was working for US Forest Service when it was discovered in southeast Missouri in July 2008 in Wayne County. In September 2013, Missouri’s quarantine expanded to include all 114 counties and the City of St. Louis. The quarantine included not allowing firewood to be brought into Missouri for fear of hitchhiking bugs. It was interesting talking to incoming campers who didn’t understand why they couldn’t bring in their own firewood. I didn’t know I had damage to my limestone hillside ash trees until I was walking through my garden checking on what wildflowers were still blooming. As I rounded one of my paths, I saw flecking. Flecking is caused by woodpeckers as they feed on emerald ash borer larvae living under the bark. Feeding starts at the top of the ash trees, where emerald ash borers prefer to settle in first. Woodpeckers will strip the bark to feed on the larvae. With bees in my garden, insecticides is not an option so my only realistic choice is to cut down the ash trees, which I will be having done shortly. University of Missouri Extension notes emerald ash borers are similar to Dutch elm disease that killed native American elm trees. This invasive bug is capable of eliminating all ash trees from our forests and cities. This makes it one of the most serious environmental threats now facing North American forests. 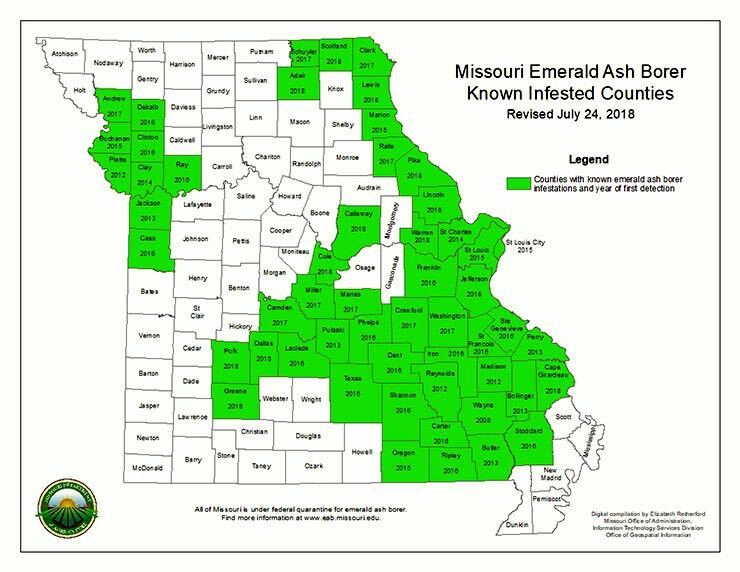 Confirmed emerald ash borers since July 24, 2018. It is expected emerald ash borers will diminish ash trees in Missouri's forests to a very low level. Although ash trees account for just three percent of Missouri’s native forest, the fast-growing shade tree is popular for landscaping. On average, about 14 percent of trees lining streets in urban settings are ash. In some neighborhoods and parks, the figure reaches as high as 30 or 40 percent. I’m told St. James, Mo. is loosing many of its old ash trees to emerald ash borers. Since its discovery, emerald ash borers have killed trees, created regulatory headaches and cost millions in control measures. It has killed hundreds of millions of ash trees in at least 34 states, caused regulatory agencies to enforce quarantines and fines and cost municipalities, property owners, nursery operators and forest products industries millions of dollars. Well, at least we tried to keep them out.